Ellms Farm has so many fun things to do in the fall, and the Great Pumpkin Race is a crowd favorite where you can imagine yourself as a game piece! 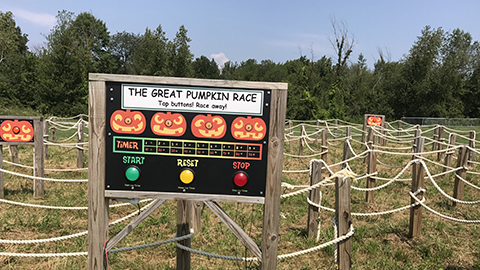 One of the nine different mazes available on our farm, the Great Pumpkin Race is a life-sized arcade game in which guests (recommended age 6 and up) try to race to the center. Participants race to the maze’s center, tag the four pumpkins, and light the lights to get their “score”. This exciting maze race takes about 2 minutes to complete. Challenge yourself to see if you can beat that time! Have a big group? Get out your stopwatches and see who can complete the maze challenge with the fastest time! While you are visiting, be sure to check out the many other fun things to do around the farm, including our Amazing Maize Corn Maze!